International commerce terms, more commonly known as Incoterms®, are a set of international rules for the interpretation of the most commonly used trade terms in foreign trade. These terms are published by the International Chamber of Commerce, and are used to help traders avoid costly misunderstandings by clarifying the tasks, costs and risks involved in the delivery of goods from sellers to buyers. Incoterms® help determine how prices and risks are designated between the importing buyer and the exporting seller with respect to shipping of products. It lets shippers take shipment transport cost and risk responsibility in hand when it benefits them most. They help improve supply chain performance by avoiding the confusion created by varied interpretations of the rules in different countries. The understanding and the proper use of applicable Terms of Sale may make the difference between future success and failure. Understanding Incoterms® and their implications to your business transactions is crucial, especially with regard to import or exports of goods. You determine your financial and commercial fate when you manage your Terms of Sale. To learn how to use Terms of Sale advantageously for your business, contact one of our logistics specialists today. 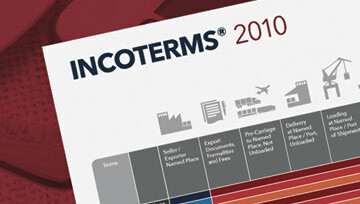 Reference, download or print the 2010 Incoterms® in PDF format.